Mental decline and dementia is not inevitable. There are important steps you can take to keep your brain ’fit for life’ during the coming decades. It is worth taking steps to ensure this from your 50s onwards and a BrainFit Consultation will enable you to put this into practice in ways that are appropriate to you as an individual. introduce you to how the brain works. look at the various lifestyle factors that can impact on your mental wellbeing. provide you with practical advice and suggestions to enable you to keep your brain ‘fit for life’. Until a few years ago we thought the brain was believed to be a fixed organ with little or no possibility of it being modified or changed. This led most people to believe that mental (cognitive) decline was an inevitable part of ageing. However, research has shown that our brains are dynamic organs with the ability to adapt and change as we go through life, even into our 90s! This is known as ‘brain plasticity’ and means that, instead of expecting our mental abilities to decline as we age, we can keep our brains developing by a lifestyle which allows it to function to its optimum potential at every stage of life. In other words, If you use it you don’t have to lose it! 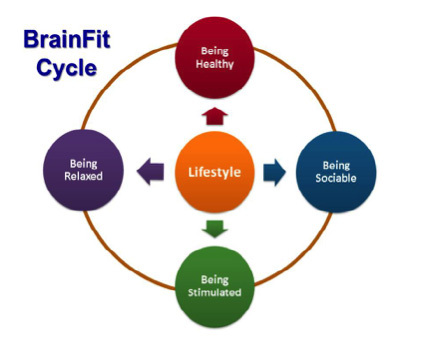 Your BrainFit Consultation focuses on 4 key goals as you age. we will explain how your brain can continue to develop at every stage of life and the lifestyle changes you should consider to keep your brain in the best shape for years to come. you will be guided through your personalised online BrainFit Plan to identify appropriate activities that will stimulate your brain for years to come. you will identify any adjustments you need to make to keep your brain ‘fit for life’. be introduced to key information about Memory and how to improve it. A separate follow-up 60 minute consultation on Memory is also available. Contact us to find out how you can arrange your personal BrainFit Consultation. Most people think mental decline due to ageing is something they cannot prevent. Brain diseases like dementia are seen as a lottery they are powerless to prevent. Since 2009 the BrainFit Workshops have been enthusiastically enjoyed by people in Community groups and Housing Associations. Over 90% said they would recommend the workshops to others. Why it is important to keep your brain healthy and ‘fit for life’. Why learning new skills and information is the best stimulus for the brain. What kind of lifestyle will keep your brain in good shape for decades. How you can improve your memory – and use it not lose it! They are also ideal for staff training and development in organisations catering for the needs of the older generation. OCN accreditation at level 1 is available for staff training. The workshops can also include an individual BrainFit Plan which recommends a range of new learning activities. This provides a ‘road map for learning’ for the years ahead.